Hi there! One of my favorite stamp sets from Clearly Besotted is 'once upon a time'. I think the images are just too adorable ♥ I knew I had to create a winter card using the sweet princess as an ice princess. The background is very simple. I just added a faint coat of 'cracked pistachio' distress ink. I also diecut some icebergs with the MFT dienamic from white and glitter cardstock. With the nuvo glitter accents in fresh snow I created some icicles. For the princess I used memento tuxedo black and Copic markers. Instead of a shoe she is holding a white glitter snowflake. I also added some sparkle to her dress with Wink of Stella. The sentiment is from 'merry messages' from Lawn Fawn. Last but not least I added some tiny silver stars and snowflakes which are diecut with the 'mini snowflakes' dies. I chose a pale metallic cardbase for this Christmas card. Hello everyone! When I saw the theme of the 141th Lawnscaping challenge I knew I had to join because I love to 'keep it clean and simple'!!! 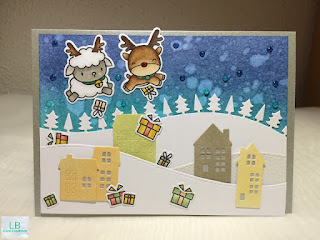 I used the stamp set 'critters in the snow' from Lawn Fawn to create the sweet images in the centre of the card. I colored them in with Copic markers and added some ice with the brilliant Nuvo accents. For the sentiment I chose the stamp set 'cozy christmas' by Mama Elephant. I diecut a oval shape from another piece of white cardstock and some snowflakes using the 'mini snowflakes' from Lawn Fawn out of white cardstock and glitter paper. Then I adhered them to the frame and added some clear drops. For today's Christmas Cards I used the images which I colored for the #dailymarker30challenge with Copics and distress inks. 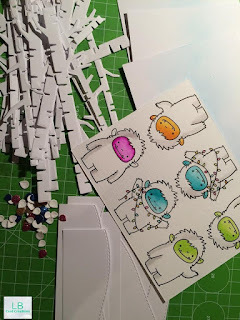 I created for cards and for each of them I diecut 2 snow hills using 'landscape trio' dies from Mama Elephant and 6 birch trees from MFT out of white cardstock. For the background I used another piece of white cardstock and blended the soft color tumbled glass. I adhered everything to the background and diecut the leafs out of glitter cardstock. After adhering them too I added the sentiment with grey ink and chose a silver/beige metallic cardbase. I created this winter scene using the 'hillside cover' die from Mama Elephant as a background. I blended the color cracked pistaccio for a light sky and added the little snow-/starfall from 'Pix's happy holiday'. I also diecut some birch trees from MFT and softly inked them up with hickory smoke distress ink. For the leaves I used white glitter paper. To complete my scene I added the cute images from 'merry everything' (MFT) and 'Pix's happy holiday' (ME) which I had colored in with Copics and fuzzy cut the day before. To add a little bit more interest I diecut some trees from the 'home collection' (ME) and inked them up with cracked pistaccio too. The sentiment was stamped with merman ink from Lawn Fawn. Thank you for stopping by and have a fantastic day!